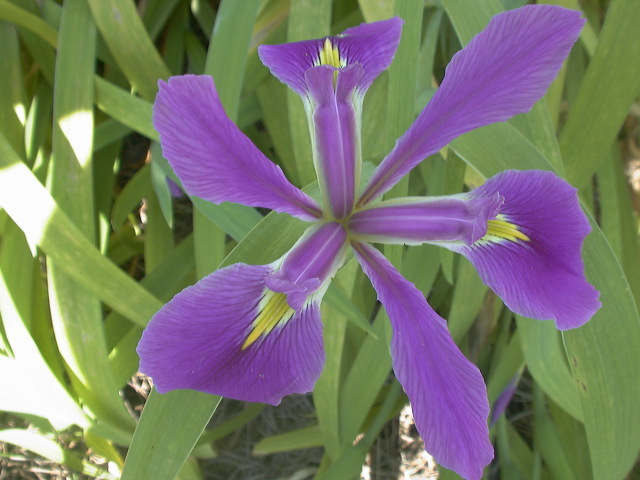 The LA iris is the official wildflower of the State of LA. The state flower is the magnolia. The magnolia is also the state flower of several other southern states. 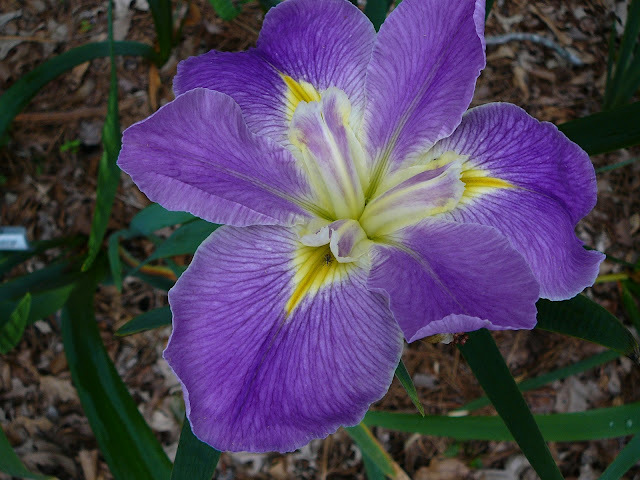 The Society for Louisiana Irises has been trying to get the state legislature to change the state flower to the LA iris. Such a change would be very expensive as all the state documents would have to be changed. So, it will probably never happen. Meantime this "wildflower", that does grow wild in LA and many other states in the south and up the Mississippi River, continues to be grown across the United States and in many foreign countries. Some of the most prolific hybridizers (those who cross one iris with another) of LA irises are located in New Zealand and Australia. LA Irises growing in "Bayou"
One of the most interesting things, to me, about the LA irises are their unusual names. Of course a lot of LA irises have "Cajun" names since south LA is the home of the LA irises and the "Cajuns" (.Cajuns are an ethnic group mainly living in the state of Louisiana, consisting of the descendants of Acadian exiles). 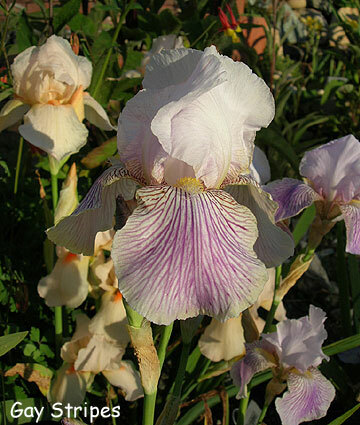 For example, 'C'est Si Bon' (Taylor, JC 1983) is a really nice LA iris with a white spray pattern around the signals and carries a very "Cajun" name. C'est Si Bon can be translated as "It's so good". 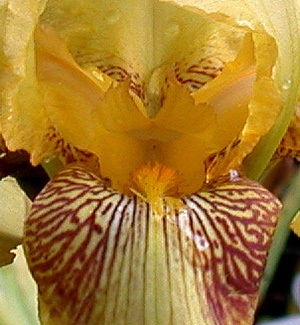 Many LA irises contain the south LA term "Bayou". A bayou is a low-lying body of water, a marsh, or a slow moving body of water or a small river. A quick search of the Society for Louisiana Irises checklist of registered LA irises revealed 51 LA irises with "Bayou" as part of the name. Just click the pictures to see them full size. 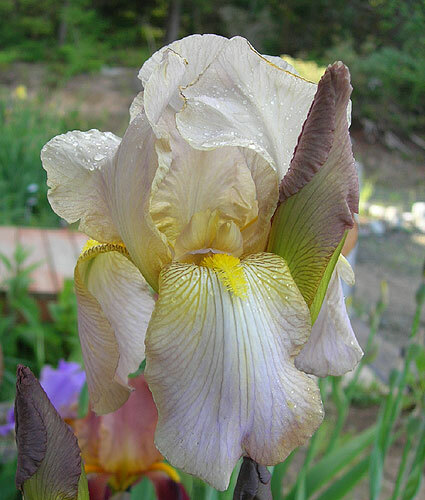 If you look at the above small selection of LA irises with "Bayou" as part of the name, and notice the date of registration, you can see how hybridizing has changed the LA iris over a period of some 50 years. All of these irises continue to be very popular and are grown in gardens throughout the US and in many overseas locations. For those who chose to use "swamp" instead of "Bayou", there are seven LA irises with swamp as part of their name. For more information on the species of irises take a look at The Species Iris Group of North America. 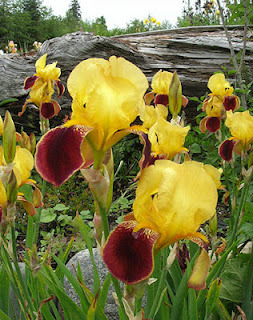 Of course, if you have irises growing in a swamp you must have irises with names like "Monster" and "Giant". 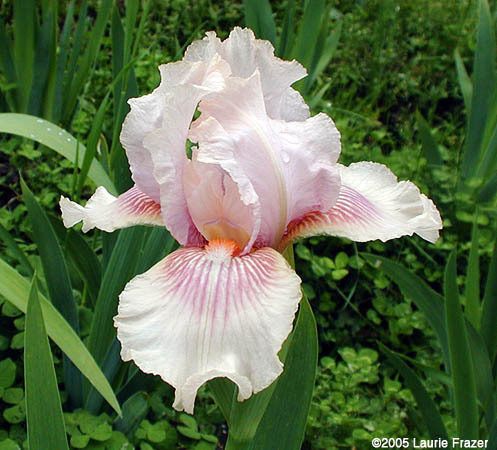 Quite a few LA irises also have "Cajun" as part of their name. This seems reasonable since the Cajuns of South LA were certainly the first ones to collect the wild LA irises from the swamps and marshes (bayous) and grow them in their gardens. There are 27 registered LA irises with "Cajun" as part of the name. 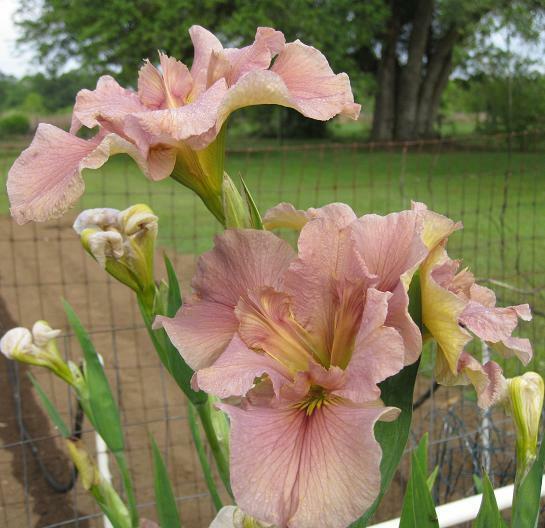 Want more LA irises with "cajun" in the name? How about Cajun Pinstripe, Cajun Wedding, Kentucky Cajun (go figure that one! 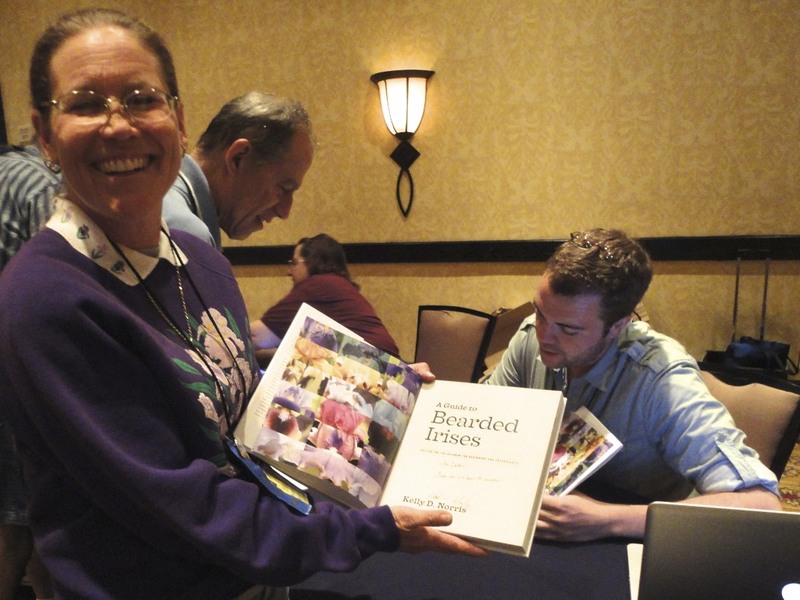 ), Cajun Lace, Cajun Angel, Cajun Belle, Cajun Cookery... The list goes on and on. 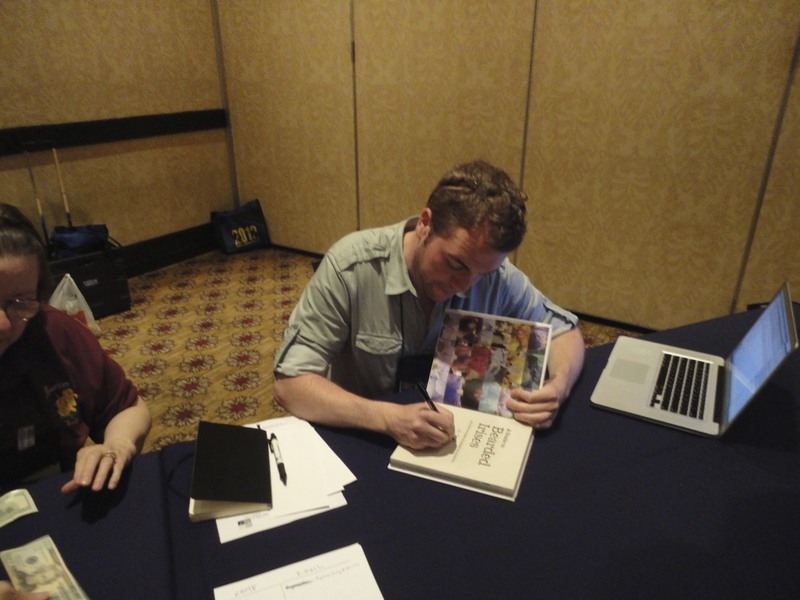 If you want to learn more about the "Cajuns" of south LA, visit Acadian Cajun for a history of the cajuns with lots of pictures and even genealogy! If you are interested in cajun food, visit The Creole and Cajun Recipe Page. 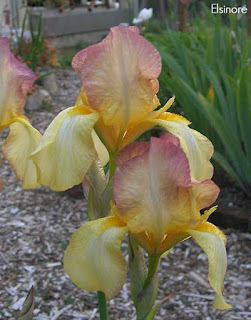 If you are interested in growing LA irises, look back at previous posts on this blog that cover that subject. Until next time, keep growing those irises and strive to learn more about LA irises and the cajuns of south LA! Whoa...Back Up...Where Did Median Iris Come From? After I posted my last blog about Median Iris titled "Medians-Who Hybridized The Little Beauties" I received a comment from a wonderful irisarian that reminded me I did not start at the beginning of the life of Medians. I fully intended to introduce everyone to the Median hybridizers who were honored with the Bennet C. Jones Award for Median Hybridzing Excellence, beginning with the first recipient and namesake of the award. But first I am going to backtrack and start with the pioneering hybridizers of the Median Iris. 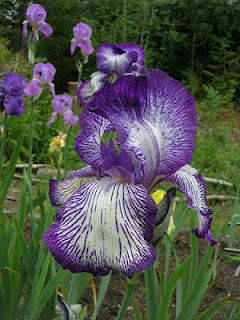 Then, I will introduce the award for the best intermediate iris and the men it is named for. 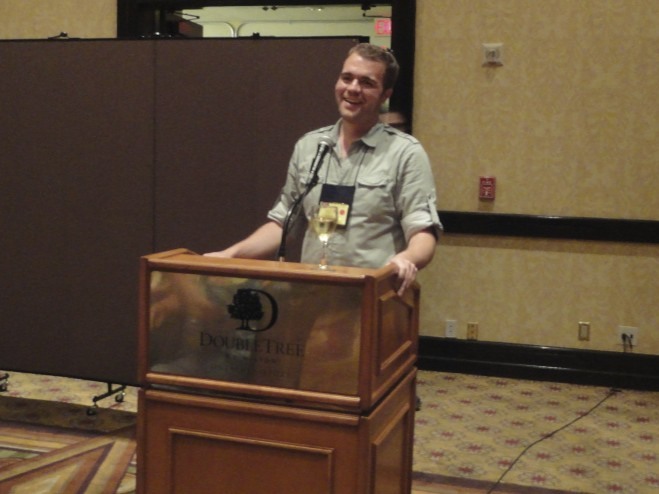 Finally, I will show you photos of some of the award winners. Much of the earliest hybridizing work was done by Foster and Dykes (UK) in the latter part of the 19th century, with crosses being made between tall and dwarf species. In 1898, William John Caparne from Guernsey, off the coast of Normandy, started selling what he called a "New Race of Irises (Intermediates)". Due to his good natured sharing, other nurserymen both in America and the UK further developed his introductions as their own. 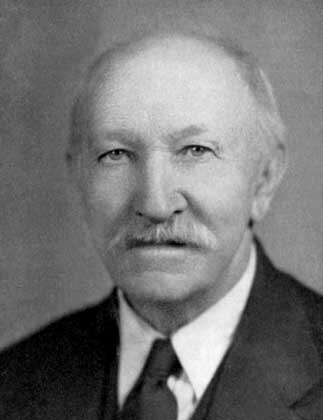 Caparne’s achievements were eclipsed to the point where even his original creation of the Intermediate hybrids became obscured. 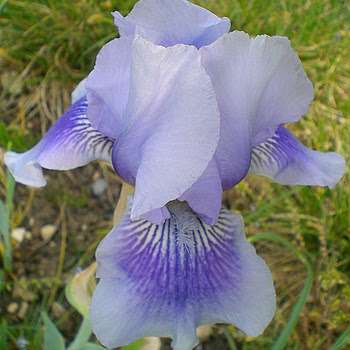 Caparne continued to develop his 'Intermediate' irises well into the mid 1930s. 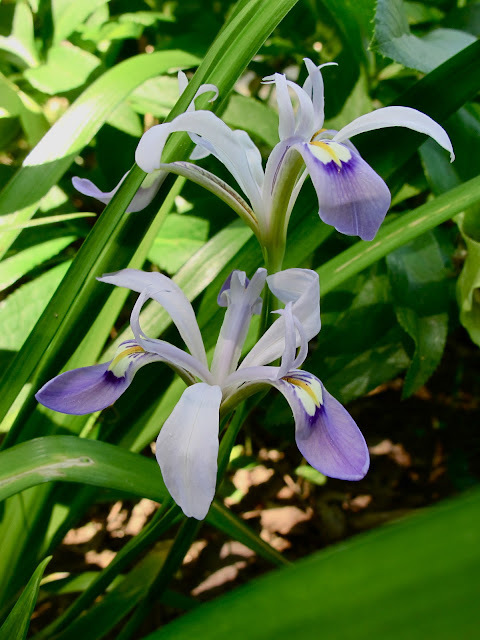 Then in the U.S. the Sass brothers, Grace Sturtevan, and others produced intermediates, and the Sass brothers crossed I. pumila with tetraploid tall bearded irises. 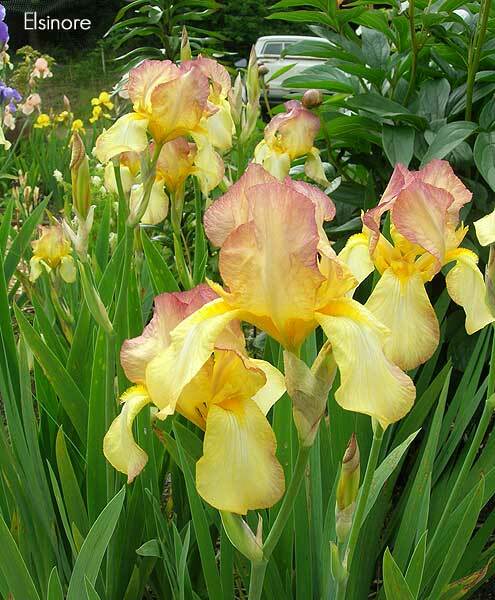 With continued work came what we now call standard dwarf bearded irises that were fertile. 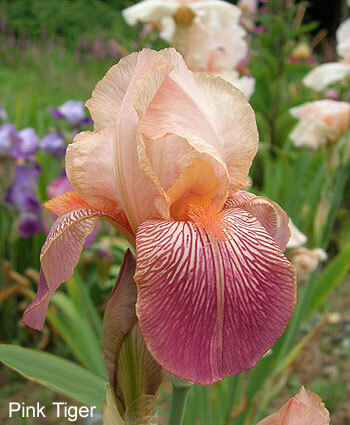 Thus the early development of Median Iris was well on its way. Hans (1868-1949) and Jacob (1872-1945) Sass were born in Alt Duvenstedt, Germany and immigrated to the United States with their parents in 1884. 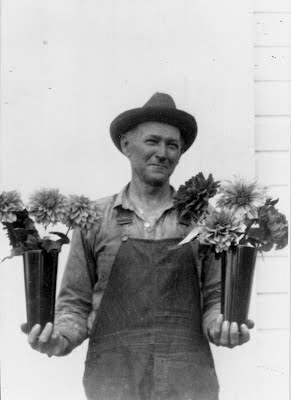 They settled on a farm in Nebraska, and were interested in breeding garden flowers at an early age. 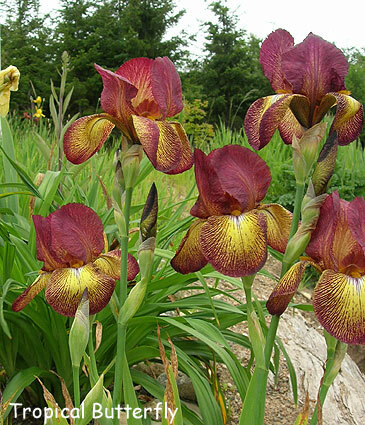 They bred irises, peonies, daylilies, lilacs, gladiolus, lilies and other garden plants. 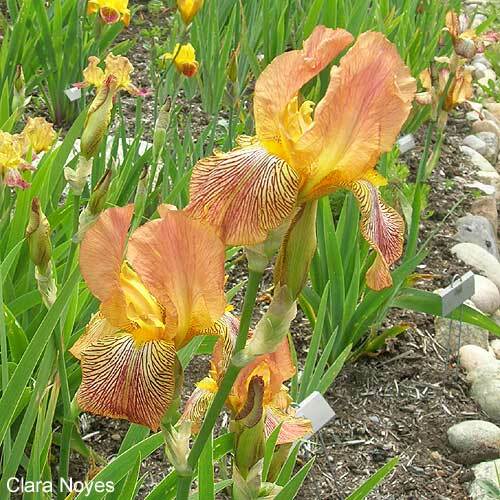 When they became charter members of The American Iris Society, they had bred irises for more than a decade. The two brothers were very close and shared ideas on hybridizing as well as seedling pollen. Their irises won many awards and are to be found throughout the pedigrees of nearly all the modern tall bearded irises in our gardens. But their early fame as hybridizers came for their work producing intermediate bearded irises. They were among the first to cross iris pumila with tall bearded iris, producing the true intermediates. 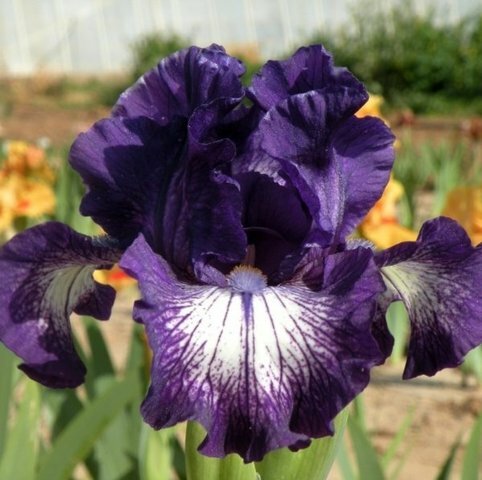 Crossing dwarf irises with tall bearded irises, they were the first American breeders to develop many new colors and forms in the intermediate class. They saw the great advantage of intermediate bearded irises on the windy prairie, and the value of a type of iris that filled out the bloom season between the early dwarf irises and the later tall bearded irises. Hans was the first to introduce a reblooming intermediate iris 'Autumn Queen', in 1926. In 1966 The American Iris Society awarded the first Hans and Jacob Sass Medal. This medal is restricted to intermediate bearded (IB) irises. The IBs are 16-27” tall with flowers that are 3½"-5" wide. The IBs fit both in size and bloom time between the SDBs and the TBs. The Hans and Jacob Sass Medals are provided by the Median Iris Society and named in honor of Hans Sass (1868-1949) and Jacob Sass (1872-1945). Below are several photos of Sass Medal winners, the year they won the award, their hybridizer and hometown. In 1947 Kenneth Smith introduced his latest creation, the wonderful classic iris 'Staten Island'. It was the child of 'The Red Admiral' crossed with the widely acclaimed 'City Of Lincoln' and went on to set the standard for color and form in its class for another decade. Variegatas had been a less popular color class, often overlooked in bearded irises, yet this one really stood out for iris growers and set a new standard of perfection. Having bright yellow standards over velvety red falls edged in the same bright yellow as the standards, and holding its many blooms on tall sturdy stems, it brought a rich and sunny aspect to the iris border. An aspect that we can still appreciate today. "For a long time City of Lincoln has ruled as King of the Variegatas. Now a new king reigns. Staten Island is certainly tops in the variegatas. Bright yellow standards and solidly colored falls a bright red with gold edge. Jauntily formed blooms." "Generally regarded as the finest true variegata of all. Standards bright golden yellow, falls velvety red, edged a very narrow band of gold." Ten years after it was introduced it was still considered tops in its class. That is the mark of a classic iris. 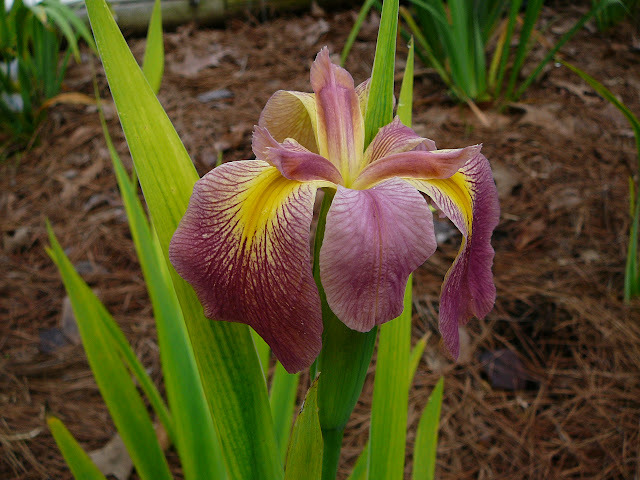 In 1940, Kenneth Smith, then a Director of the American Iris Society, instituted the first Iris Symposium, with only a selected 50 AIS judges balloting. The results were compiled and the "Popularity Poll" was born. In 1941, all acredited judges participated and the symposium became an annual event. Not until 1944, however, did the Directors vote to make the Symposium official. Through the 1951 poll, the voting was still restricted to accredited judges only, but in 1952 Harold Knowleton, then serving as AIS president, had the Symposium opened to all members. 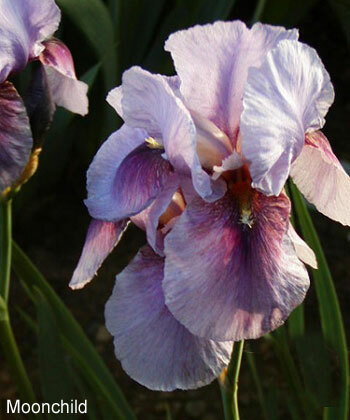 History was made and a valuable new tool became available to all for evaluating how well an iris variety would do in a wide variety of gardens. 'Staten Island' stayed at the top of the charts for its color class for many years after it was introduced and was the standard to beat for new introductions. It's beautiful colors, exceptional hardiness and vigor, coupled with a reliability of bloom still give it good garden value today, and it is truly a classic variety that is well deserving of preservation and appreciation for may years to come. I am so thankful to my friend Linda, who had this wonderful iris growing in the yard of her new home and kindly shared it with me, bringing year after year of beauty to my garden. If you enjoy such rich color combinations you cannot go wrong with this lovely old variety. Try it, you'll like it. The classic iris 'Elsinore' is one of the marvelous creations of Charles Henry Hall, of Pennsylvania. A child of (Lohengrin x ... ) X Aurea, it was introduced in 1925. Mr. Hall was well regarded for the quality of the flowers he produced and 'Elsinore' was no exception. It was well spoken of but never found a wide fame, which is unfortunate as it is a great garden plant in every way. It is hardy and a vigorous grower, a reliable bloomer, and it blooms over a long period as well. When you get a look at the beautiful flowers you'll see why it is so special and worthy of holding up for admiration. 'Elsinore' is an iris of great charm and grace, while still retaining a bright and cheerful aspect that makes it such a sunny addition to the garden. The yellow is a lovely soft primrose, with the standards lightly blushed rose along the top and accented with bright lemon yellow beards. The petals have a long aspect giving a clump the look of a fully lit candelabra. It lights up the whole area when the sun shines upon it. A Tall Bearded variety, it reaches around 30 inches in my garden and has a lovely soft fragrance. Cooley's Gardens catalog for 1937 described 'Elsinore' as: "
A flower but little known, and one which is deserving of greater popularity. Of only medium size, its dainty blossoms of pale primrose-yellow are delicately edged and stained violet, and are produced abundantly. Something different. Try it." I have to agree with Cooley's assessment. it is such a wonderful garden plant and really different from any other. Its lovely old fashioned form, its presence in a garden border, and all of its good performance attributes all serve to make this one a real stand out variety and one well worth growing and preserving today. 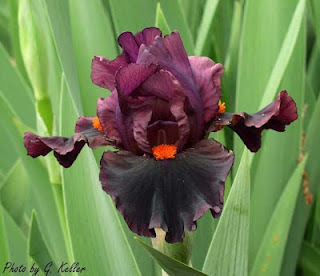 And speaking of historic irises: If you're looking for gardens where you can view collections of historic irises please check out the Display Gardens listings at the Historic Iris Preservation Society website. Many HIPS members generously open their gardens to visitors each spring and it is a great way to see which varieties do well in your area. Given the vagaries of the season it is best to contact the gardeners ahead of time to make sure there will be blooms to see. This is a great program HIPS offers to promote the preservation of these great old flowers, I hope you'll take advantage of it. Iris speculatrix has an amusing name. The Latin translation is female spy or watcher. I like to get more literal and think of this as the pretty little Iris that wears glasses. This is an evergreen Iris hardy in USDA Zone 6 but happier in zones 7 to 9 and maybe even warmer. In my Kansas City garden I must mulch it with shredded leaves every fall as a cold winter wind can dry the leaves. This sports the most beautiful glossy green foliage of any Iris I have grown. Of course we all grow iris for the flowers and I. speculatrix does extremely well at that. It has delicate looking blooms the size of I. cristata but held well above the leaves at 10 to 12 inches high. 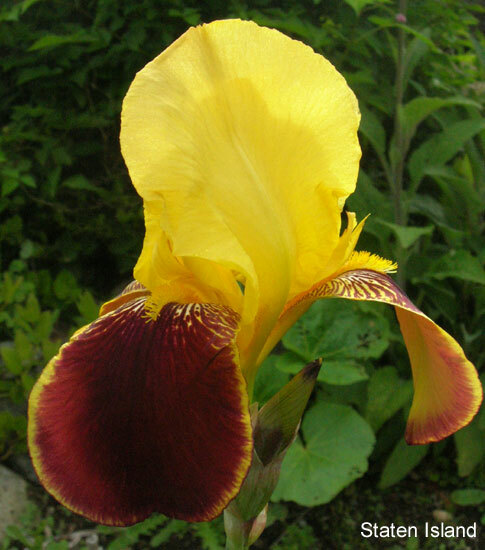 This is the tallest of any iris in the Chinenses Series. The color ranges from palest violet to royal purple. But it is the signal area that really stands out. It has well defined twin spots on the falls, or as I see it, she wears glasses. This blossoms in mid to late spring with two buds per stem. This iris has an unusual habit when it goes to seed. The seed pods have an acute point and bend at a 90 degree angle from the stem. 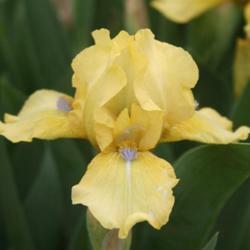 This has proven to be a very easy iris to grow in light to moderate shade and quite drought tolerant. I have not tried it in a damp area as those don't exist in my garden. 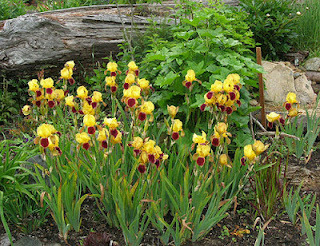 Although grown sporadically for decades, it seems never to have been propagated and available from commercial Iris nurseries. 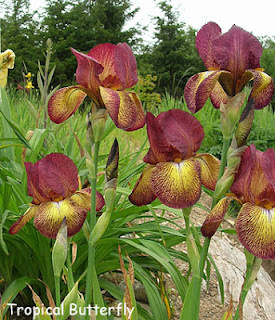 I don't know anyone selling these irises. 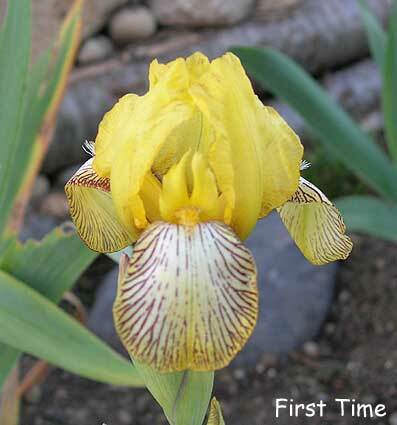 Darrell Probst found an Iris in China that looks to be a cousin to I. speculatrix. It has not been described or named yet. It is quite a bit smaller and flowers in early spring. It also has evergreen foliage and intriguing blue flowers. 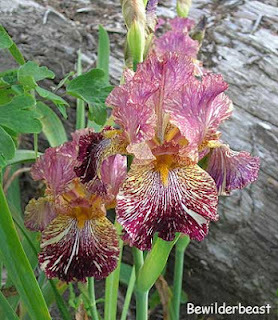 So here's two more Chinese Iris species that deserve to be in the gardens of adventurous gardeners. Obviously we need more nurseries that specialize in these smaller species. 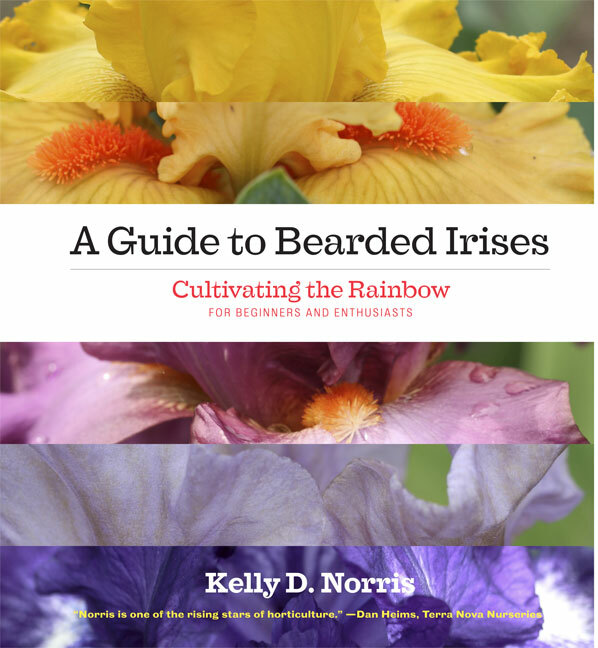 Please join me while I congratulate our friend and colleague, the Editor of The American Iris Society's quarterly magazine, IRISES, Kelly D. Norris. Kelly is in the final stages, and almost ready to publish his book, "A Guide To Bearded Irises," and had a few copies available for us to enjoy, acquire and take home with us during the recent National Convention of The American Iris Society, held in Ontario, CA. Although the actual publishing date is set for May 23rd, we were very happy to take home this precious book earlier than anticipated. 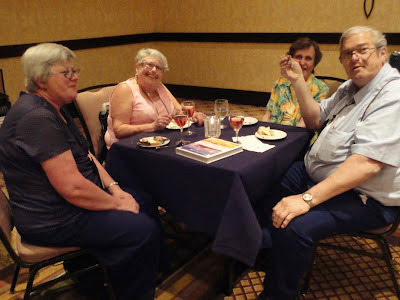 We took part of a formal reception that we all enjoyed (photos below). It was very inspiring to see (experience, is really a better word) Kelly in this fashion. I felt like a father who has recently seen his son graduate. So proud of him. It is something special, when someone from "the iris family" turns a corner and achieves a moment like this. I wish you much success Kelly. "With this book I feel like I'm telling an epic story about how to grow and love magically colored bearded irises, complete with a dashing cast of characters, a rich historical backdrop, and an optimistic and enterprising protagonist -- you. 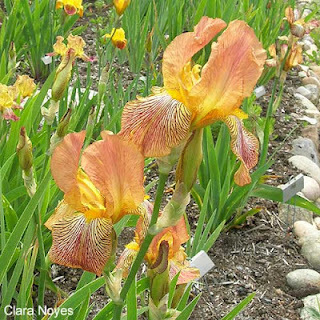 This is a book about iris lovers -- plant lovers of a special kind who seek out rhizome sales like garage sales, track the comings and goings of bearded irises with unabashed addiction, and approach color-laden standards, falls and beards without fear. If you're holding this book, you're lover already, or one in eager training." Kelly, you're describing me to perfection. Timber Press has more information about the book, please click on the link to get more information. For an interesting and educational meeting, a Digital Program may satisfy and stimulate your garden club or chapter’s interest in all types of irises. Pre-orders are being taken for the April 2012 American Iris Society Convention that was held in Ontario, California. 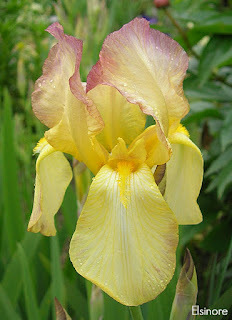 It will show the various gardens and irises that were blooming at the time. It will be available for purchase soon. They are $15.00 each, which includes postage ($25.00 for international orders). 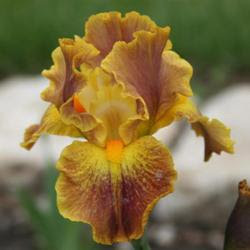 Please visit our website, for more information on The American Iris Society Presentations. I love all the various reticulations, veining and striping we see in the incredibly wide range of patterns that we are so fortunate to enjoy in the iris family. 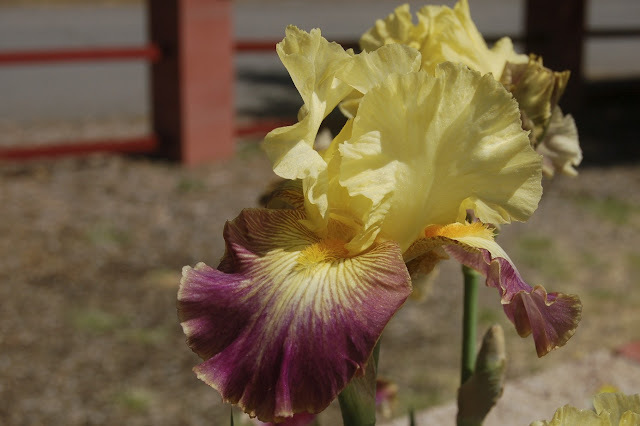 All throughout iris history hybridizers have often worked to remove veining, creating smoothly colored irises, devoid of the intricate patterns that all the variations of veining afford us. 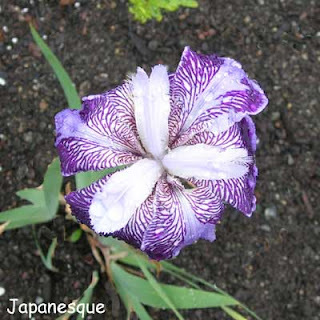 It was a worthy cause and advanced the palette for the flowers, but let us not forget just how wonderful that veining can be as an asset to an iris, not a detraction. What follows is a series of photos of varieties I have enjoyed growing over the years that are enhanced by the wonderful veining. 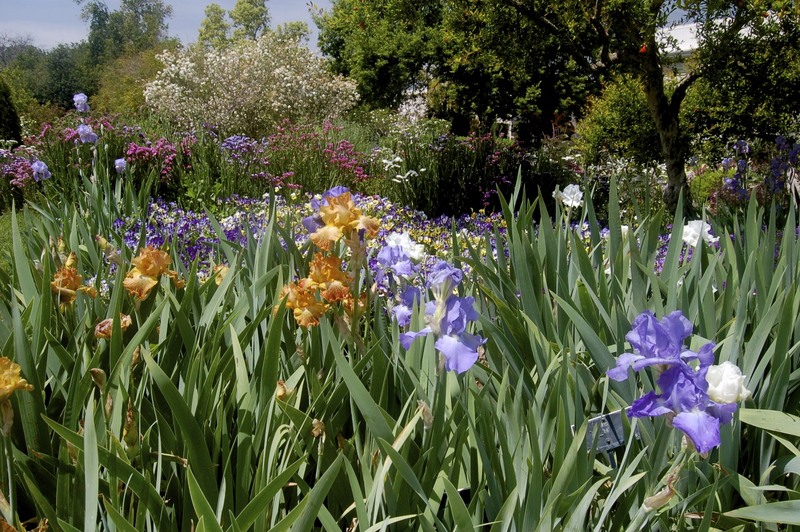 Far from being something to be improved these varieties take their colorful patterns as a mark of distinction and proudly showcase what a wide range irises offer the gardener, thanks to the keen eye of hybridizers who appreciated their value. As always, click the photos for closer views. First up 'Honey Chile' (Salbach, 1940). A lovely soft gold with with red-brown veining at the hafts - how's that for a reversal of the usual gold veined hafts on red? 'First Time' (Welch, 1963) brings those red veins down onto the lower falls in faint tracery on a white ground edged old gold. So sweet! 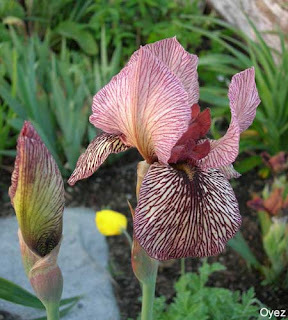 'Japanesque' (Farr, 1922) is a masterful example of the use of veining to enhance the bloom. The reticulations on this one really make a bold statement, especially when there are six falls to show them off! 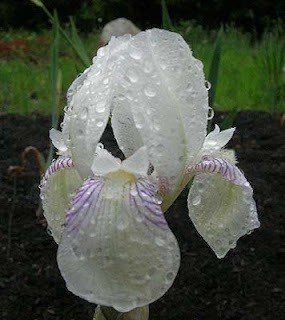 'Bewilderbeast' (Kasperek,1994) is a great example of a modern iris using the classic reticulations in a new manner. The broken color pattern follows the classic veining road map to create a vivid and exciting splash of colors. 'Gay Stripes' (Fielding, 1957) was named for it's best feature - the lovely soft striping on its falls. 'Oyez' (White, 1938) is a marvelous variety with a very striking pattern of deep red veining on softer pinkish ground. Decidedly different. Likewise, 'Circus Stripes' (Plough, 1975) which exhibits its finest trait quite beautifully, with deep purple veins on a lovely clean white ground. Visually arresting in the garden! 'Pink Tiger' (Eldorado, 1965) brings this same striped aesthetic to a warm and delicious blend of pink and apricot with deeper rose veining. 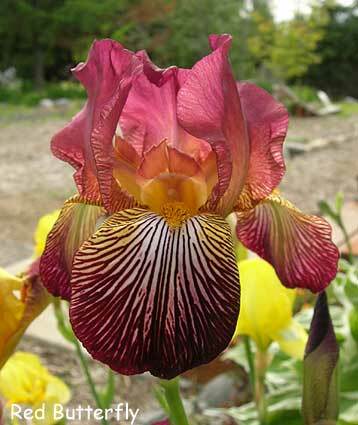 'Red Butterfly' (Linse, 1955) is a really striking example of the use of veining to enhance an iris bloom. What a remarkable pattern has been wrought in this one! 'Tropical Butterfly' (Carstenson, 1963) is similar, but takes the pattern to a whole new height with the width of the petals and depth of color, adding a cream-yellow ground to set off the dark red. 'Mrs. Horace Darwin' (Foster, 1888) takes the opposite path. Here we see the minimalist use of veining to accent a bloom otherwise a self. Sublime. 'Clara Noyes' (H.P. Sass, 1930) is an example of a variety that used the veining to create a blended effect when viewed from a distance in the garden. The yellow and pink tones combined to give an apricot effect from a distance, and brought with it much attention from admirers. Last I'll show you something completely different - here we have 'Calcutta' (Kleinsorge, 1938) which features gold threads darting thru the petals that from a distance appear soft buff washed lavender at the center. A really beautiful effect. What a truly spectacular flower to contain so many different ways to display color and draw the eye. I hope you will take a few minutes to look for examples of great use of veining in your iris patch this season. It can so often enhance the flower rather than detract from it. This post just barely scratches the surface on this topic. The beardless species offer their own variations on veining that are equally as striking. But that is a post for another day.